Girard-Perregaux Sea Hawk - takes a bold stance with its vivid hues. The new Sea Hawk takes a bold stance with its vivid hues. 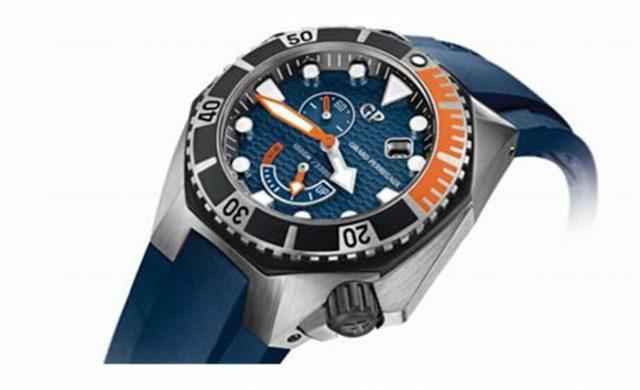 Cobalt blue and coral orange are the colors chosen for the dial, the hands and the unidirectional bezel of this diver’s instrument offers cutting-edge performance in a sporty style. The Sea Hawk maintains the technical and visual characteristics that have made this line, updated in 2012, so successful. The cobalt blue of the dial and strap give the timepiece its nautical hue, while the minute and second hands and the power reserve indicator are picked out in orange, the same shade that highlights the first 15 minutes of a dive time on the bezel. The dial features a raised “honeycomb” motif. The threedimensional hour markers are coated on the top side with a luminescent substance guaranteeing readability in darkness. A sloping flange, graduated with the minute scale, forms an aesthetic link between dial and case. The date at 2 o’clock, visible through an aperture with polished sides, plays with the appearance of asymmetry. The power reserve indicator stands out clearly at 6 o’clock – an area in orange showing the point at which the movement must be rewound – and the small second is positioned at 10 o’clock. The hands are covered with a luminescent material and can be read perfectly in darkness. The rotating unidirectional bezel encircling the sapphire crystal is designed to track a dive time, its notched edge making it easily adjustable. The case, manufactured from stainless steel, boasts state-of-the-art technology and acclaimed watchmaking expertise as a guarantor of superior performance. It comprises several faceted surfaces with a subtle satin finish. A screw-down black rubber crown is set into a protrusion at 4 o’clock, providing reinforced protection against external impact. The watch has a diameter of 44 mm, a thickness of 17.1 mm and incorporates 38 elements. Guaranteed water-resistant up to a depth of 1,000 meters, it meets the requirements set by the international standard ISO 6425 for diving watches. In addition, a helium valve ensures the air pressure between the watch’s interior, and its exterior environment is rebalanced after deep-water diving expeditions. The strap is made of rubber, expressly colored cobalt blue, and fitted with a folding steel safety buckle. The Sea Hawk is equipped with the Brand’s in-house GP03300 self-winding mechanical movement. It has hour, minute, second, and date functions, together with a certified 46-hour power reserve indicator with a frequency reaching 28,800 vibrations per hour, or 4 Hz.